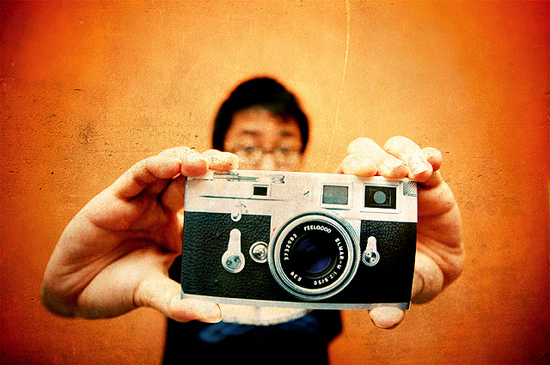 If you are a lover of photographic art a trip to Amsterdam’s Foam Museum is a must. Rosie Khdir explores the photographic wonders in this renovated old canal house. The Foam Museum is a fantastic museum for modern photographic art, with exhibitions covering local themes such as crime and universal themes such as Kate Moss. Here is a rundown of the current shows at Foam. Perhaps the most famous photos by Johan van der Keuken is a dance scene on the Ile Saint-Louis in Paris, which was taken during the ‘Quatorze Juillet’ or Bastille Day celebration in 1958. This photo provides us with the centre on which this exhibition revolves around. This photo was first published in 1964 and since then another 32 negatives that were taken on that same day have been found in Van der Keuken’s archives. These special images have never been published before but now make up the Johan van der Keuken – Pictorial Narratives exhibition at Foam. Foam_3h exhibition, by Danish photographer Eva Marie Rødbro, shows her travels to Texas where she photographed and filmed a group of young people in their daily lives. Rødbro’s Lone Stars show combines portraits, still lifes and landscapes, shot in a distinctive and personal natural style. The exhibition consists of approximately forty colour and black-and-white photos and a video work. This is a new exhibition by Russian photographer Alexander Gronsky, winner of the 2010 Foam Paul Huf Award. This is an annual prize by Foam which is awarded to a young, promising international photographer under the age of 35. As part of the prize Gronsky was awarded a show at Foam for his photographs of the post-Soviet landscape taken between 2007 and 2010. This powerful exhibition features work from the series Less Than One and The Edge which focuses on regions in Russia hinterland, where the average population density is less than one per square kilometer. If you would like to take a look at these inspiring exhibitions then P&O Ferries can help you on your way to Amsterdam with the Hull to Rotterdam overnight ferry. From there it is just a short drive to Amsterdam. The ideal getaway for the upcoming autumn period is a cosy relaxing weekend in a beautiful French Chateaux. Rosie Khdir looks round the charming Châteaux of Normandy. Gorgeous regal architecture, period furnishings and immaculate grounds are usually what you can expect from a classic French Chateaux, as well as fine foods and wine and a roaring fire in the winter time. Here we have compiled a selection of the very best for you to consider for a nice autumn break. This beautiful estate is the perfect stopover between the sea and the countryside for lovers of the coast and fine greenery of northern France. The building is located in a park of 11 hectares, of which the rooms have stunning views. The chateau has a variety of opulent rooms that reflect the estates past, in particular the Sissi room, so named after the Empress Sissi, Queen of Hungary, who stayed here in 1875. The restaurant “Le 3 roses” serves gourmet food that mixed both tradition flavours and more creative presentation. Visitors have use of tennis courts and a riding club onsite as well as a golf course in nearby Étretat and the Bénédictine Museum in Fécamp. This delightful family château dates back to the 18th Century and was fully restored in 1988, becoming a luxury hotel and restaurant. In great contrast to its WWII history, during which the chateau was occupied by German troop, the hotel now serves as a haven of relaxation for its guests. It features 29 luxury rooms, all dressed with a romantic mix of antique and modern furnishings. The hotel offers a heated pool and orangery, enclosed gardens, jogging trail, croquet greens and rose garden, all set within the 12 hectare landscaped grounds. The Domaine de Joinville Château is a beautiful 24 room, period style establishment with a history that stretches almost 200 years. Rooms range from standard board to suites and grand apartments and are decorated in varying modern and traditional styles. La Ferme Modèle du Parc, the hotel’s restaurant, is the former castle farm where the king and his court used to enjoy refreshments after a trip to the beach – and still offers food fit for royalty. If you would like to experience a relaxing holiday at one of these beautiful Chateaux then P&O Ferries can get you to Normandy for an excellent price! The P&O Ferries Dover to Calais service starts from just £30 for a car and up to nine people and from Calais it is only a short drive to any of these destinations. 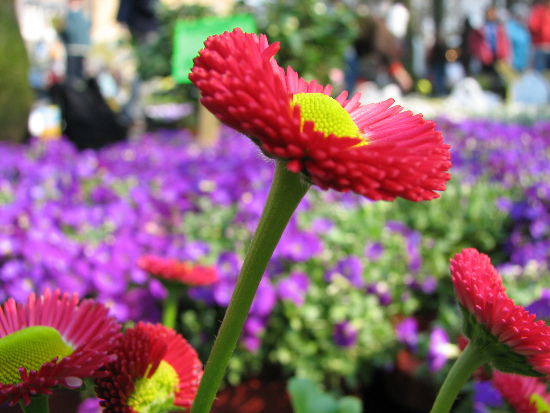 Weekend flower markets in one of Europe’s oldest cities, Karim Beerahee explores Utrecht. If you wish to find one of Europe’s cultrural centers at its most beautiful, be sure to spend a Saturday walking around Utrecht. At the weekend this ancient city blooms as the canal-side walkways become lined with flower stalls. A truly scenic Autumn getaway trip awaits, submersing you in the natural colour of the world from the leaves at your feet to the red-orange treetops and masterfully grown and arranged bouquets on the market stalls all around you. From 7AM to 4PM the path lining the Old Canal (Oude Gracht) is a botanical marvel of colour and perfumic scents. We would however advise hayfever sufferers to reconsider the inner city sights though. If a day wandering amongst exquisite carnations isn’t enough, the ancient buildings and world class museums and art galleries of Utrecht are sure give you your fill of culture. Book now while the flowers are still in season, P&O and get you there with a Hull to Rotterdam Ferry! Efteling, a fairytale theme park! We all dream of fairytale lands as children, where elves and fairy princesses live among talking trees. In Holland there really is such a place! Rosie Khdir explores Efteling. 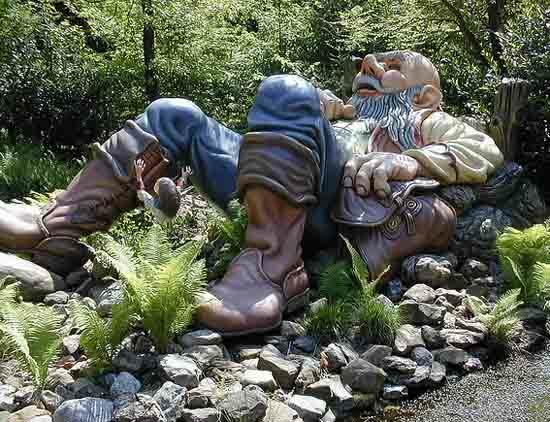 Efteling, located in the town of Kaatsheuvel, is one of the oldest theme parks in the world. It began as a sports park back in 1935 and evolved into a nature park with the opening of its Fairytale Forest in 1952. Since then Efteling has grown into a full-size theme park with rollercoasters and various other amusements. Efteling is divided into different realms and here is a run-down of what you will find in each one. This is the realm which holds the famous Fairytale Forest, the oldest part of the theme park, where you can meet characters from 24 different fairy stories, including Rapunzel, Hansel and Gretel, Sleeping beauty and the Frog Prince. This is the part of the park where all the daredevils go, where rides such as The Mysterious Ship and the Python, a double-looped rollercoaster, reside. This realm explores different cultures with attractions such as the Pagode and Carnaval Festival celebrating and representing different countries. The Alternative Realm hold a variety of attractions, including the white-water Piraña ride, the SalzburgerLand Village, the Creepy Castle and The exciting 3D adventure at PandaDroom. If you want to take a visit to Holland and see this magical land for yourself then P&O Ferries can help you on your way. You can get the Hull to Rotterdam overnight ferry service starting from £149 each way. 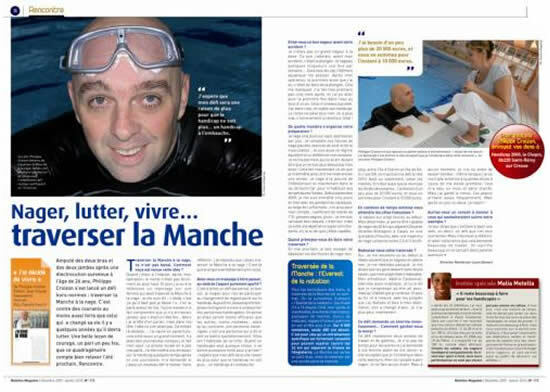 After 2 years and more than 1820 hours training Philippe Croizon will take on one of the most inspirational cross-channel challenges ever made, and become the first limbless person to attempt the 21 mile swim between England and France. Just over 135 years after Captain Matthew Webb achieved world-wide fame by becoming the first able bodied man to swim the English Channel, Philippe Croizon will attempt to go one better and do it without the use of his arms or legs. Using especially designed prosthetic legs that have flippers attached to them; he is expected to take between 20 – 24 hours to complete the crossing, travelling at a speed of 1.8 miles an hour and stopping regularly to fuel his body for the arduous challenge. Mr Criozon, from Saint-Rémy-sur-Creuse in West France, lost his limbs after an electrical accident at his home. But rather than sink into despair he has chosen to remake himself by taking on this incredible challenge, to prove that the human spirit can always be greater than the cruel hand of fate. He has been training at a rate of about 35 hours a week for the last two years assisted by his swimming coach Valérie Carbonel. Swimming the English Channel can be fraught with difficulties, from strength sapping temperatures to highly changeable weather, yet the hardest part can be overcoming the mental challenge when you are stuck out in the middle of the sea and your body is yearning for you to stop. It’s a factor that’s defeated many people in the past who have enjoyed full use of their limbs, so the task that Mr Croizon has set himself is quite monumental. We’re sure that the whole world wishes him the very best of luck. a year old this museum is must-see destination filled with enough treasure to satisfy the most ardent Tintin fan. And with P&O Ferries dropping you off nearby in either Calais or Zeebrugge getting there is easy. The creations of Hergé are utterly fantastic; it’s difficult to imagine the gaping cultural hole that would have existed had he not created these incredible adventures. For millions of us around the world they not only provided an escape from the humdrum afternoons of childhood but also acted as sort of My First National Geographic. Where was the first time you ever saw the historic archaeological city of Petra or became aware of the ancient Aztec civilizations? The Adventures of Tintin took you on a voyage of discovery, not only through new worlds but new concepts – slavery, revolution, empire and even the geopolitical implications of the Middle East’s vast oil wealth were all ideas that were first introduced to our young minds by the genius of Hergé. 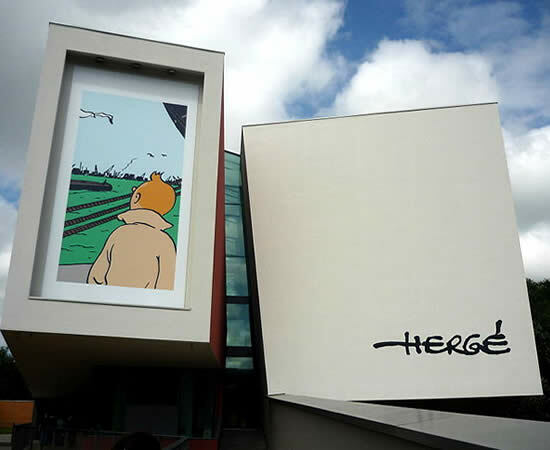 You can visit the Hergé Museum and discover more about the author Georges Rémi – who penned the Tintin books under the pseudonym Hergé. It lies 30KM outside of Brussels in the town of Louvain-la-Neuve and is spread out over eight floors. You’ll find lots of information about Tintin’s creator himself as well as a wealth of original artwork. If you would like to discover the wonders of Tintin for yourself you can. P&O Ferries offers an overnight service from Hull to Zeebrugge. Or you can take the Dover to Calais crossing starting from just £30 for a car and up to nine people; from Calais it is just a few hours’ drive to Brussels. Dover Port has operated as a trust for the last 400 years with all its profits being reinvested in its business instead of being distributed among shareholders. News that the port’s board have asked the government to consider a privatisation scheme could change this forever. Those in favour of privatising the port argue that Dover Port, which is already the largest passenger port in northern Europe, must be free to act commercially – raising loans and investing heavily in new infrastructure – is vital to remain competitive. Under the present system this is not allowed. However the idea of privatisation is worrying many people in Dover whose livelihoods depend on the jobs provided by the millions of freight and passenger vehicles that use Dover as their gateway to the continent. Many, including the unions, fear that private ownership will lead to the demise of Dover Port. The idea of the port falling into the hands of foreign owners is particularly galling, with Dover’s unique place in British history making the concept appear contrary to the British interest. Such is the gravity of this issue that even Dame Vera Lynn – who immortalised Dover with her classic World War II ballad The White Cliffs of Dover – has entered the fray, voicing support for a scheme backed by local Conservative MP Charlie Elphicke that would see the creation of a ‘People’s Port’ where locals could join together to buy shares and keep the port locally owned. The second public consultation has now taken place and a decision is expected to take place sometime in the coming autumn.